I've been obsessed with fashion ever since I can remember, and overdressing has been a thing for the longest time in my life. One would think that these two things are antithetical, that if you love fashion, you love dressing fashionably, but, for me at atleast, this simply wasn't true. Until very recently I loved fashion so much that I wanted to try all of the colours, all of the silhouettes, all of the trends, often all at once. The latest type I tried was the evening gown. Trust me, I had never donned a gown before this that enhanced my curves and filled in me the confidence to rock the ramp (maybe one day). Thanks to SUBHA MEHRA for creating this beautiful piece and convincing me to pose in it for a few shots for A TALE BY SUTA - Subha's designer brand under which she creates some fabulous designs for girls that aren't only exceptional but also divine! Interestingly, I've realised that nothing can beat the classic elegance of a long flowing evening gown. You can dress any woman in an evening gown and watch her change into an absolute diva! There is an endless list of styles and patterns that are designed. From high school proms to Oscar nights to cocktail parties, elegant formal gowns make their presence felt everywhere. It simply accentuates the curves of curvy women, and hides the flaws of stout women. Slender and petite women look stunning in these too. Thus, there is a gown for women of every body type! The piece that I'm donning in these pictures is purely magical. Made of scuba fabric in a flowy style with graceful cuts on the back filling me with feelings of amour! 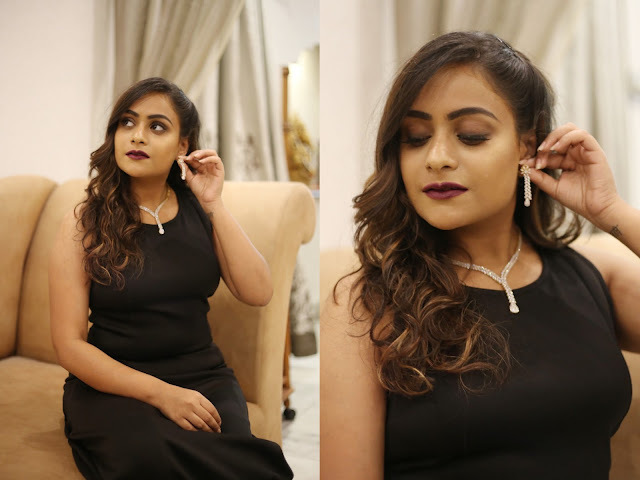 I chose to accessorize my look with a sleek diamond necklace from PUNJAB JEWELLERS AND SONS, that came in a set with a pair of earrings & ring as well. You will have to agree that it makes the look complete and vivacious at the same time! PS : I can’t thank my makeup artist SIMRAN TANEJA enough for making me appear an absolute stunner. It’s mystical how she plays with some brushes on my face and transforms me into a dream everytime! Some darker hues this time with smokey eyes, plum lips and lots of highlight for utter boldness. There was the time, as a young girl, where I refused to wear anything except for pink, and anything except for skirts, which resulted in weather-inappropriate outfits, many trips to ballet uniform stores, and, I'm sure, a firm belief by my mother that the world is far too gendered. 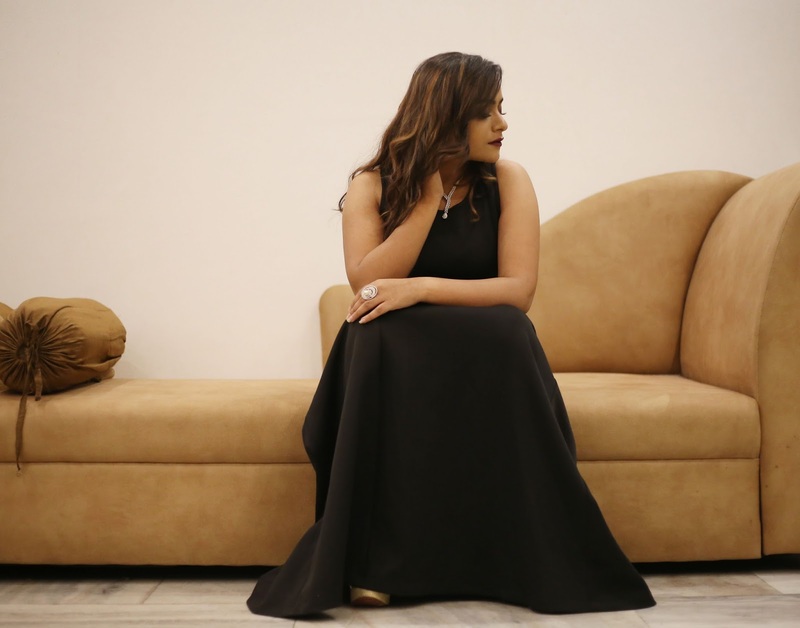 Finally, there was the time I undid all this girliness and bought everything black, and turned into the most stylish wardrobe decision I’ve ever made with also some black gowns hanging in there. As for this one, it has my ladylike heart forever! I hope you liked reading this post and gazing at the pictures, as much as I loved shooting for it and writing for you. Do drop in your comments in case you want to send some love to my team for helping me dress the best, or for any queries. Until next time, love and luck! you look gorgeous! Amazing dress, & after reading your post, came to realize that you have a wardrobe full of awesome dresses. Looking gorgeous in back gowns. checkout latest designer gowns on IndiaRush fashion store.